Welcome to Lisa.B.Designs : Time to Relax - Imagination Craft's Art Stamps Designed by Lisa B. Time to Relax - Imagination Craft's Art Stamps Designed by Lisa B. Good morning all! Martina here with the first of this month's posts looking at the two Art Stamp Sets (Time to Celebrate and Take Time) designed by Lisa B. for Imagination Crafts. We had a play with these at Lisa's last class and everyone enjoyed working with them; it was amazing to see the completely different styles and colours that were used to make cards for all occasions! I am really enjoying building up layers at the moment in all my makes, it is a fab excuse to grab those stencils and play...I seem to have so many, but each one serves a different purpose I'm sure, and of course I always NEED more!!! To start my card this week, I cut a panel from Super Smooth Card to the correct size for a main topper. Using my old favourite, Vintage Photo Distress Ink, I coloured the card, darkening the edges with Walnut Stain. I then used the Mosaic Sun Stencil from Imagination Crafts to add some background detail with the same inks (I love this stencil as it can be used for so many men/boys/generic cards just to add a slight 'hint' in the background). With my feint background done, I started using my stamps from the Time To Celebrate Stamp Plate and the Take Time Set. I stamped the main image with Sepia Versafine and heat embossed with Clear Wow Powder. I used lots of the little accent stamps to add detail, using a combination of first and second generation ink impressions. In some areas (difficult to see here I know) I added some detail with a Paint Touch White Paint Pen to make areas pop from the background. Setting the topper panel aside, I stamped the main clock image again, this time on Acetate using Jet Black Staz-On Ink. I then spread a thick layer of Diamond Sparkle Medium over the wings and set aside to dry. I wanted to make a frame for my topper to sit on, so I cut a panel to size and then stamped my choice of phrase from the Take Time and Time to Celebrate Stamps around the edges. There are a couple of very handy little accents in the sets; I chose a little corner stamp to finish the corners. 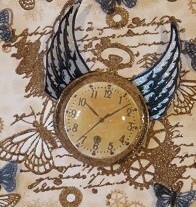 Once my sparkly wings were dry, I cut around these, one whole clock face with rim and one face only. The face only I coloured with the inks and then used my embossing tool on the reverse to raise it giving a bevelled look. I assembled the clock together and raised it up so that it 'pinged' from the middle. To make the clock face shiny I used some Glossy Accents. When I looked at the card I was not happy, so I decided to use the tiny butterfly stamp from the Time to Celebrate Set, stamp this several times on Acetate and add Sparkle Medium as before. I attached them all over the card with red tape, making sure the wings flapped up! I hope you like it; there are so many stamps between the two Time Art Stamp Sets it really is worth having them both so that you can interchange them!